The U.S. Bureau of Labor Statistics has released the Annual Inflation rate today. For the year ending in January, inflation was 1.58% up very slightly from 1.50% for the year ending in December 2013. Annual inflation is made up of 12 monthly inflation components and although monthly inflation was virtually Zero for December 2013 and rose to 0.37% in January. This fits well with the historical trend of low inflation in the 4th quarter and high inflation in the first quarter of the year. The Consumer Price Index came in at 233.916 in January which was actually lower than it was back in September of 2013 when it was 234.149. This is the result of three intervening deflationary months of October, November and December which “rolled back” prices to almost August levels when they were 233.877. Historically speaking inflation is still at very low levels in spite of all of the FED’s Quantitative Easing. This may be partially the result of bank’s desire to increase their reserves after the scare they got in 2008. It also may be the result of low interest rates i.e. since rates are so low banks are unwilling to take on any additional risk and are therefore content to loan the money back to the FED at virtually no risk. This means that the money isn’t circulating and therefore the money multiplier is very low. Monthly inflation for 2013 was a bit erratic. Typically the first quarter of the year is the highest and we saw monthly inflation rates of 0.30%, 0.82% and 0.26% for January, February and March respectively. April erased a bit of those gains with a negative -0.10% and May had a moderately low 0.18% while June was 0.24% (which would annualize to 2.88%) but July was virtually zero and August and September were low at 0.12% and October was a negative -0.26% wiping out all of August and September’s price increases (plus some). November 2013 was also negative at -0.20%. Monthly inflation for December was -0.01% or virtually zero. The nationwide retail Cost of Gasoline (Regular) averaged $3.306 in January 2014 virtually identical to $3.29 in January 2013. Monthly inflation was high for January through April 2012. January was 0.44%, February was 0.44%, March was very high at 0.76% and April 2012 was 0.30%. The trend broke in May as inflation fell to negative territory (monthly deflation, annual disinflation) giving back a bit of the price increases. June continued the trend with another negative month knocking the Annual inflation rate down from 1.70% in May to 1.66% in June. And July followed up with another decrease to 1.41%. The next three months were inflationary… August brought the inflation rate back to 1.69%, September rose to 1.99%, and October rose to 2.16%. November and December were disinflationary (monthly deflation) at 1.76% and 1.74% respectively. Historically, inflation seems to be higher the first half of the year and then lower or even negative the second half. We have to go all the way back to 2003 to find a single negative month in the January through April months. While the second half of almost every year has at least one negative month. As a matter of fact, in the months since January 1954 there have been 13 negative months in January through June and 47 negative months in the July through December months. So it appears that the majority of inflation occurs in the first half of the year and then moderates for the second half. One possible explanation is that during the fourth quarter many stores hold massive sales (think Black Friday) to reduce inventory before year end. 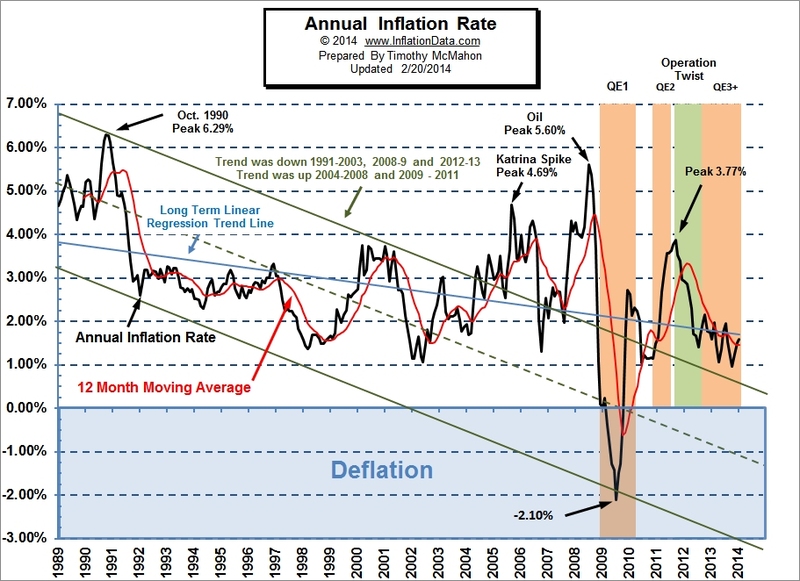 In 2012 deflation began earlier i.e. shifted from the end of the year to the middle of the year (May – July) with August and September positive and October and November negative again. If you are interested in the Current Inflation Rate or the Historical Inflation Rate we have tables and charts for them.